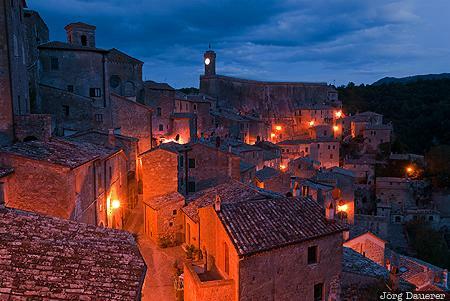 The floodlit houses of the tuffa city of Sorano with the panoramic terrace Masso Leopoldino at the center at the blue hour before sunrise. Sorano is in the province Grosseto in the southern part of Tuscany, Italy. This photo was taken in the morning of a sunny day in October of 2009. This photo was taken with a digital camera.